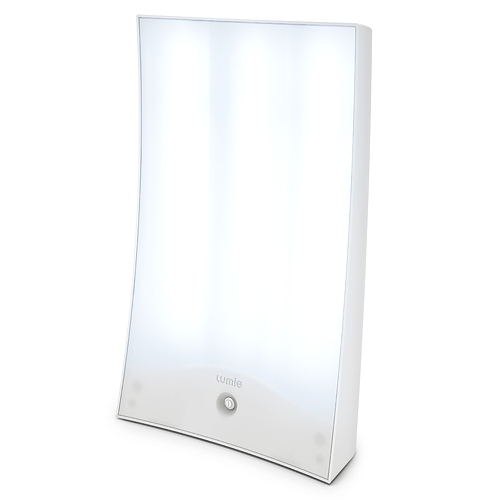 The Lumie Brazil is the most powerful light box in the Lumie range. The Lumie Brazil has been elegantly designed with a concave diffuser and provides fast, effective treatment for the medical condition Seasonal Affective Disorder (SAD) and the winter blues. Just as sunlight naturally makes you feel good in the summer, getting extra bright light in winter when stuck indoors is proven to put you in a better mood, boost alertness and help you to feel more awake and productive. It has been scientifically proven that low levels of light make many people feel fed-up, tired and less energetic; which helps to explain why lots of people find winters so depressing. So, if you spend part of the year feeling less than your usual bright and active self, then a SAD Light box like the Lumie Brazil could be for you. Please note that this product is suitable for normal single vision glasses and contact lenses. It should not be used with sunglasses, photo-sensitive or reaction glasses (clear to tinted lenses in stronger sunlight) as this can reduce the effectiveness of light therapy. Below are reviews of Lumie Brazil - SAD Light Box - Concave Light Diffuser by bodykind customers. If you have tried this product we'd love to hear what you think so please leave a review. The Lumie Brazil is the most powerful light box in the range. 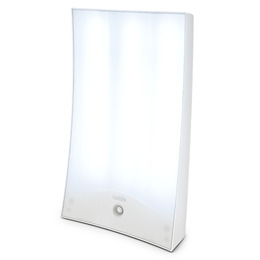 It has been elegantly designed with a concave diffuser and provides fast, effective treatment for Seasonal Affective Disorder (SAD) and the winter blues.